terms of, among other things, the tracking of infectious disease among its clients/patients. What infections should be tracked? How should the tracking be accomplished and documented? 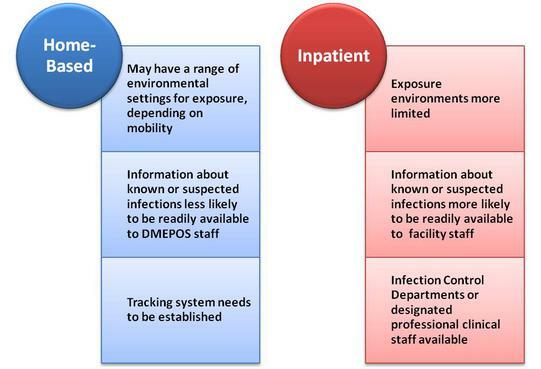 The graphic above illustrates that DMEPOS providers are in a situation where it can be relatively problematic to identify specific infections among the clients/patients they serve. Obtain as complete a list of relevant diagnoses as possible from the client/patient's physician or other referrer. Ensure good communication between DMEPOS and other home-based providers (e.g., Home Health, Hospice). Establish a routine system to collect infection information from clients/patients/family/caregivers (e.g., checklist item on the plan of service/care). If the client/patient is receiving Clinical Respiratory Care Services (i.e., "hands-on", therapeutic, diagnostic, assessment, and/or other services requiring a licensed healthcare clinician) from company professional clinicians (i.e., Respiratory Therapists, Registered Nurses), infection data is obtained through the clinical assessment process and should be communicated to all affected staff, as applicable (e.g., Delivery Technicians). Any infection data that is obtained should be documented in the client/patient record and in Performance Improvement statistics. Keep in mind that it is essential that all individually identifiable client/patient information be excluded from PI reports when tabulating this data. PI analysis should be centered around identifying trends and looking for ways to enhance existing infection control processes. In addition to collecting statistical data, it is also important to evaluate individual client/patient infection events on a case-by-case for the purposes of implementing specific staff infection control exposure measures (e.g., use of appropriate Personal Protective Equipment) and in order to keep company infection control policies and procedures updated. The area of infection control is broad and contains many elements. This article has been written with the intent to provide only a general review of some of the main considerations involved in addressing the tracking of DMEPOS client/patient infections.